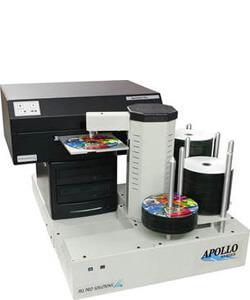 The Apollo MD Series consists of systems that are PC-connected and configured with 2 or 4 drives, inkjet or thermal printer, and from 220 to 630 disc capacity. The systems provide automated disc burning capabilities to easily, efficiently, and economically create stunning CDs or DVDs for referring physicians or patients. 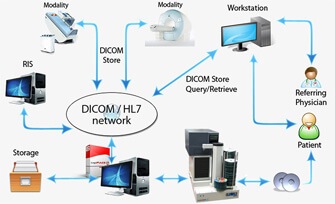 Published discs are each uniquely labeled and can include the full-fidelity images, DICOM DIR, Html pages, multiple viewers, Profiles, Web Access, AES 256bit Encryption, Drag&Drop, and more. The Zeus MD Series consists of systems that are fully automated with a full PC built-in along with a Windows operating system and all the necessary software and drivers all preinstalled. 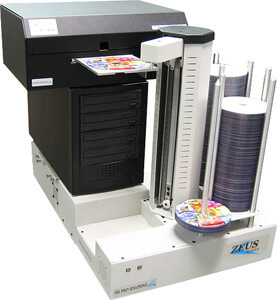 The Zeus MD systems are also configured with 2 or 4 drives, inkjet or thermal printer, and from 220 to 630 disc capacity (depending on the printer). The systems provide automated disc burning capabilities to easily, efficiently, and economically create stunning CDs or DVDs for referring physicians or patients. Published discs are each uniquely labeled and can include the full-fidelity images, DICOM DIR, Html pages, multiple viewers, Profiles, Web Access, AES 256bit Encryption, Drag&Drop, and more.